In following the media celebrity, Steve Harvey, and his latest and greatest brand, The Steve Harvey Talk Show, an interesting topic came to me… How many of us actually assess the status of our love lives, marriages and/or relationships by what we watch on talk shows? Steve Harvey’s résumé may read like a non-stop success story, but the Emmy Award-winning television host, radio personality, and bestselling author would hardly describe his personal journey as seamless. In fact, for Harvey, some of the most poignant moments in his life have been related to the bumps in the road. Find out more about Steve Harvey’s ‘Act Like A Success Conference’ here. Steve Harvey may have the strategies for success, but he’s adamant that we can’t always predict what our exact success story may be. “See, it’s putting one foot in front of the other that leads you down a road that we’ve never– none of us have gone on before. It’s called the future. So all you’ve got to do is keep walking into the future. We don’t know what it is. We don’t know what it holds. If we did, this would be a different life for us. But I think also, I’ve never been afraid to reinvent myself. I’ve never been afraid to be open to what else God has for me. That’s where people get stuck. See, don’t get stuck on what you want. There could be a really greater vision or greater plan for you, not based on just what you want. What should you be in life? Not just where you want to be, but where should you be in life? And that will get shown to you if you stay in the process. Don’t be afraid to reinvent yourself,” notes Harvey. Listen to Nancy’s interview with Steve Harvey here, on iTunes, or Stitcher Radio. 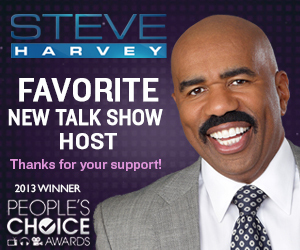 Here’s a link to Steve Harvey’s twitter account.